intellectual excitement, moral earnestness, and pleasure in words. The commentary and detailed analysis that Paton provides is an invaluable and necessary guide for the student and general reader. origin of the solar system. Some of Kant's writings in the early 1760s attracted the favorable notice of respected philosophers such as J. H. Lambert and Moses Mendelssohn, but a professorship eluded Kant until he was over 45. In 1781 Kant finally published his great work, the Critique of Pure Reason. The early reviews were hostile and uncomprehending, and Kant's attempt to make his theories more accessible in his Prolegomena to Any Future Metaphysics (1783) was largely unsuccessful. Then, partly through the influence of former student J. G. Herder, whose writings on anthropology and history challenged his Enlightenment convictions, Kant turned his attention to issues in the philosophy of morality and history, writing several short essays on the philosophy of history and sketching his ethical theory in the Foundations of the Metaphysics of Morals (1785). Kant's new philosophical approach began to receive attention in 1786 through a series of articles in a widely circulated Gottingen journal by the Jena philosopher K. L. Reinhold. 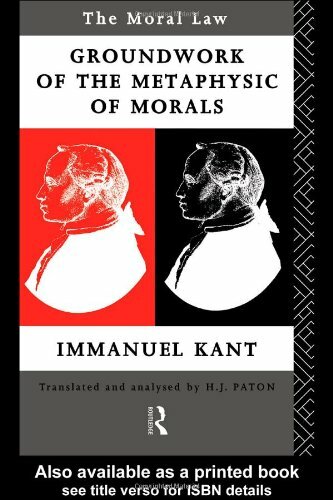 The following year Kant published a new, extensively revised edition of the Critique, following it up with the Critique of Practical Reason (1788), treating the foundations of moral philosophy, and the Critique of Judgment (1790), an examination of aesthetics rounding out his system through a strikingly original treatment of two topics that were widely perceived as high on the philosophical agenda at the time - the philosophical meaning of the taste for beauty and the use of teleology in natural science. From the early 1790s onward, Kant was regarded by the coming generation of philosophers as having overthrown all previous systems and as having opened up a whole new philosophical vista. During the last decade of his philosophical activity, Kant devoted most of his attention to applications of moral philosophy. His two chief works in the 1790s were Religion Within the Bounds of Plain Reason (1793--94) and Metaphysics of Morals (1798), the first part of which contained Kant's theory of right, law, and the political state. At the age of 74, most philosophers who are still active are engaged in consolidating and defending views they have already worked out. Kant, however, had perceived an important gap in his system and had begun rethinking its foundations. These attempts went on for four more years until the ravages of old age finally destroyed Kant's capacity for further intellectual work. The result was a lengthy but disorganized manuscript that was first published in 1920 under the title Opus Postumum. It displays the impact of some of the more radical young thinkers Kant's philosophy itself had inspired. Kant's philosophy focuses attention on the active role of human reason in the process of knowing the world and on its autonomy in giving moral law. Kant saw the development of reason as a collective possession of the human species, a product of nature working through human history. For him the process of free communication between independent minds is the very life of reason, the vocation of which is to remake politics, religion, science, art, and morality as the completion of a destiny whose shape it is our collective task to frame for ourselves.